Gerard Pique has hailed Lionel Messi as the ‘greatest player in history’ and says he is not surprised if Manchester City boss Pep Guardiola wants to take the Barcelona star to the Etihad. Guardiola returns to the Nou Camp on Wednesday night to face the club where he won the European Cup three times as a player and then coach, moulding Messi and his teammates into the best club side on the planet. 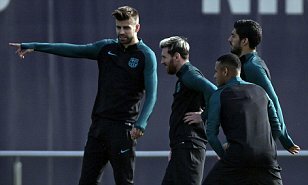 And Pique paid tribute to the five-time Ballon d’Or winner who will be man who City fear most as they try to keep pace with Luis Enrique’s side at the top of Group C. City have already signed goalkeeper Claudio Bravo from Barca, and Pique admits that they could target the likes of Messi, Neymar and Luis Suarez as well. ‘He is the best player in the world, the best player in history,’ said the former Manchester United centre-back. ‘A club with the financial capacity like Manchester City can sign any player in the world and it’s no surprise they focus on players from Barcelona. ‘I wouldn’t be surprised if they tried to sign players from Barcelona, not because Pep is family here, but because it would be stupid to think that. ‘I think Messi is the best in the world, no doubt, and he gives us a lot no matter whether he’s 100 per cent or 10 per cent because he’s so different and so good. Just his presence on the pitch has an effect on us, and maybe the other team. Neymar is set to sign a new deal at Barcelona, but Pique refused to rule out the prospect of the Brazilian superstar leaving the Nou Camp later in his career. 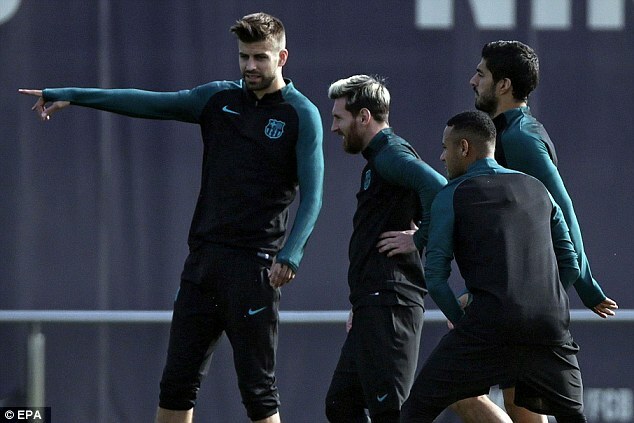 With Guardiola quickly imposing his style of play on City, Pique acknowledged that they will face a very similar style of play to their own in the Nou Camp on Wednesday night. 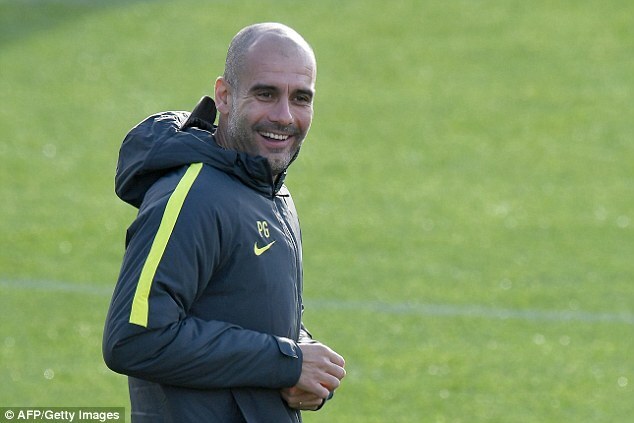 He added: ‘Guardiola made a mark on all of us one way or another. He changed the history of the club. There was a before and after. We understand football in a different way since he was here. I can only praise a coach that gave us so much. I came from not playing at Manchester United and here he gave me everything. ‘City are very different to last year, obviously because Pep is in charge and has changed their way of understanding football. It will be a challenge for us because it’s a team that plays in a very similar way to us, they’ll pressure us a lot high up and it will be hard for us to keep the ball. ‘We want to be first in the group and to do that we have to win tomorrow. Although there will be games afterwards that we will also have to win, winning tomorrow would almost assure we are top of the group. 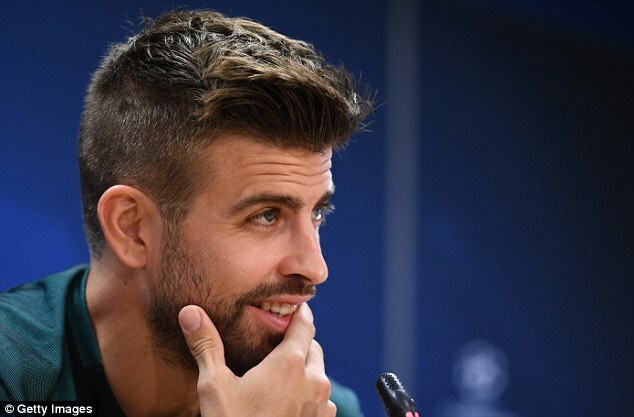 Asked about his surprise announcement that he will quit the Spain national team after the next World Cup in 2018, 29-year-old Pique ruled out a U-turn. He said: ‘It’s the final decision. I deserve to leave how I want to.